Friends of Uplands Park - The First Six Years (2010 - 2015) | Creating opportunities for stewardship, education and inspiration, focusing on Uplands Park, Oak Bay, BC, Canada. In November 2015, a new Friends of Uplands Park (FOUP) website was launched at http://friendsofuplandspark.org. Please connect to http://friendsofuplandspark.org. Bookmark this new FOUP website and sign up, at the new website, to receive news of forthcoming FOUP events and activities. The original Friends of Uplands Park website, under the title Friends of Uplands Park – The First Six Years (2010 – 2015), will remain available to celebrate the activities and accomplishments of the first 6 years of FOUP. The URL of the original FOUP website remains https://friendsofuplandspark.wordpress.com. 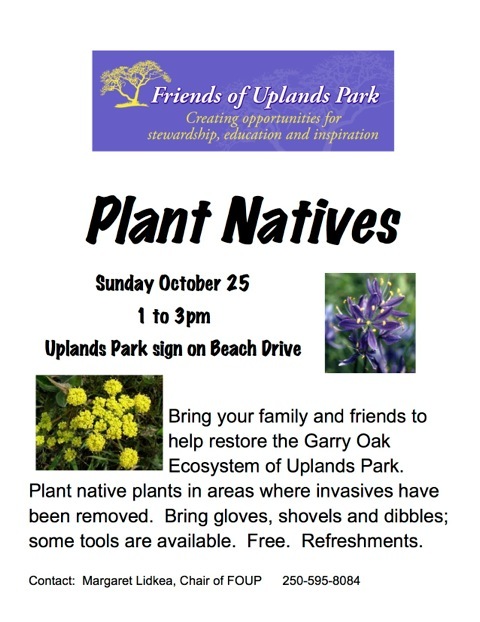 The Friends of Uplands Park invites you to bring family and friends to help with the restoration of the Garry Oak Ecosystems in Uplands Park. Native plants will be planted where invasive plants have recently been removed. Bring gloves, shovels and dibbles. Some tools will be available and refreshments too. 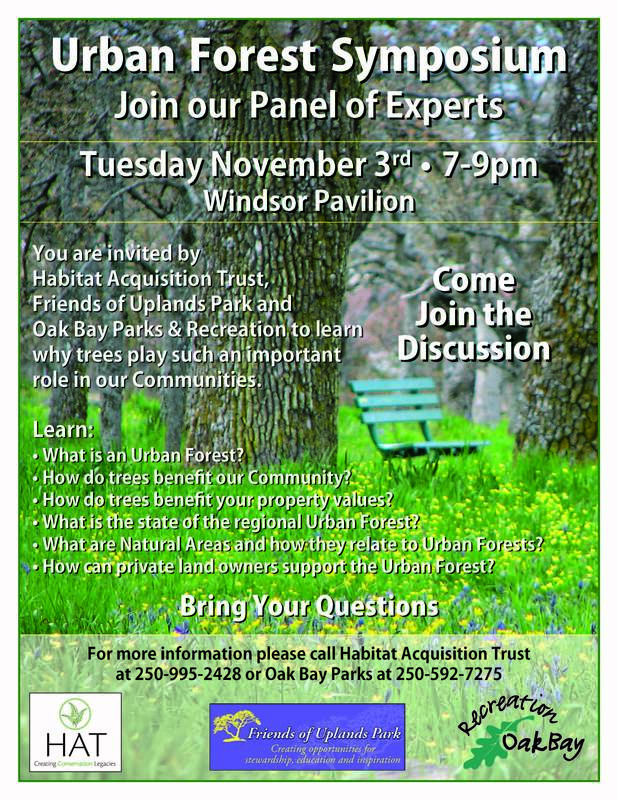 Margaret Lidkea sends the following announcement, and invitation, to attend the important Oak Bay Urban Forest Symposium, to be held at Windsor Park Pavilion, November 3, 2015, 7-9pm. 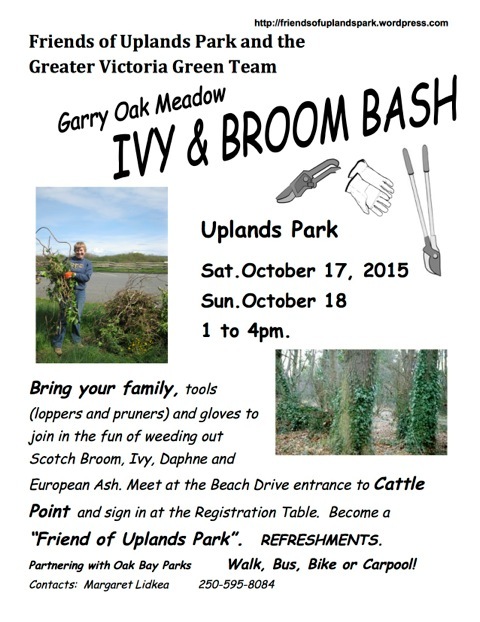 The Friends of Uplands Park and the Greater Victoria Green Team are collaborating in hosting the Annual Uplands Park Ivy & Broom Bash weekend event. This is a family friendly “rain or shine” work party event. Tools (loppers & pruners) and gloves will be provided, but please bring your own tools and gloves if you have them. The goal is to continue with the removal of Scotch Broom, Ivy, Daphne and European Ash. Refreshments will be on hand, but it is a good idea to bring your water bottle. Meet at the Beach Drive entrance to Cattle Point to sign in and to be given a work area. Thanks in advance for your participation in this important work. 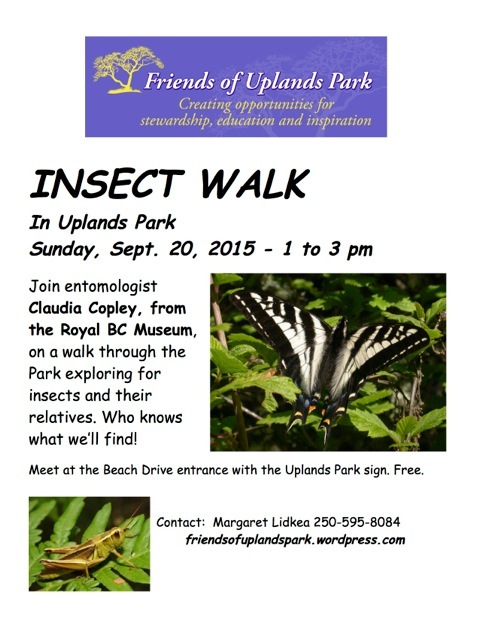 The Friends of Uplands Park invites you to join RBCM entomologist Claudia Copley, on a walk through Uplands Park exploring for insects. Meet at the Beach Drive entrance at the Uplands Park sign. #1 On Saturday, September 19, Geoffrey will lead the Friends of Uplands Park bird Walk. Please meet at 8:00 a.m. in the large parking lot out at the end of Cattle Point. 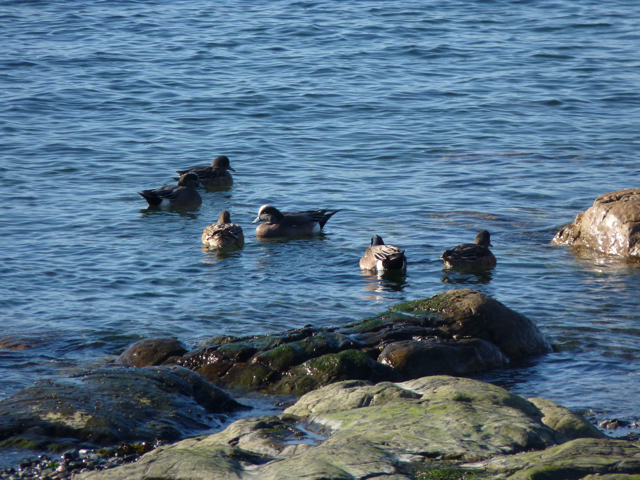 Uplands Park is at the north end of Willows Beach in Oak Bay. After observing sea and shore birds, we will head inland into the park to listen to and search for the many songbirds in this fabulous Garry Oak Meadow Community. On his August walk 65 species, including a Common Tern were observed! #2 On Saturday, September 26 , Geoffrey will be attending the CRD Hawk Watch (Capital Regional District) in East Sooke Regional Park. This event is put on by the CRD in conjunction with the Victoria Natural History Sociey . The event is from 12 to 3 p.m. Typically, many types of raptors, Band-tailed Pigeons, Vaux’s Swifts and other migrants will be observed in large numbers. There will be a display tent regarding this mass migration at Aylard Farm. However, Geoffrey will be up at Beechey Head hoping to see you. You will be walking up and then down, a fairly steep and long path to Beechey Head from Aylard Farm. The hike takes about 30 minutes each way. The Aylard Farm entrance into East Sooke Regional Park is off Becher Bay Road. #3 On Saturday, October 3 , from 10:00 a.m. to 3:00 p.m., Geoffrey will be continuing with a second Hawk Watch for the CRD, entitled The Birds of Beechey Head.Meet at the Aylard Farm Parking Lot at 10:00 a.m. for the hike up to Beechey Head.